The Reebok Super Ramp RL 7.0 elliptical offers a 19–21" adjustable stride length plus the steepest incline ramp available on an elliptical priced under $1000. You can achieve results faster thanks to the variety of resistance, inclines, and programs this model offers. The new backlit Grafixx™ display tracks speed, time, distance, pulse, and calories burned. The workout programs include two calorie-burn workouts and two customizable Create & Save™ Workouts, where you pick your goal, incline, resistance, and time length so that you can do your favorite exercise routine without having to reprogram it each time. To expand your workout selections, the Reebok Super Ramp RL 7.0 elliptical also offers a console slot for iFit® Workout Cards (sold separately). UPDATE: The Reebok Super Ramp RL 7.0 is no longer being sold, and the company is no longer making ellipticals. Check out our Best Ellipticals Under $1000 for a much better option. Users are either completely satisfied with the sturdy quiet ride or they complain that the unit was shipped in non-working order or had missing parts. The Reebok RL 7.0 is a very large machine with a long footprint (over 6½ feet) as well as being extremely heavy. The weight and length make it a very stable elliptical machine, and another plus is the new curved Super Ramp™ adjustable incline that provides a longer stride and greater range of motion to target the calves as well as the upper legs, glutes, and abs. Other features of the Reebok Super Ramp RL 7.0 include Quick-Touch™ In-Handle controls for resistance and incline adjustments, 20 digital resistance levels, 20 programs plus compatibility with iFit® card technology, a 325-lb user weight capacity, built-in integrated speakers on the console, plus a plug-in port for an iPod® or other mp3 device. 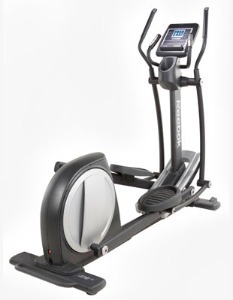 The Reebok Super Ramp RL 7.0 elliptical is identical to its ProForm cousin, the 1050E model. Keep in mind that all ProForm, Reebok, and NordicTrack ellipticals are made by parent company ICON Fitness at the same factory, and that the only difference is the name decal stuck on the frame. Armed with this knowledge, look for a price discrepancy when either the Reebok RL 7.0 or the ProForm are on sale at $799 and buy whichever is the lowest price. At $799, either choice is a decent elliptical. But if you are looking to spend $999 on a trainer, you can get better value if you go with a Horizon or Yowza model.